IWGP Intercontinental champion Hiroshi Tanahashi vs. Tetsuya Naito. 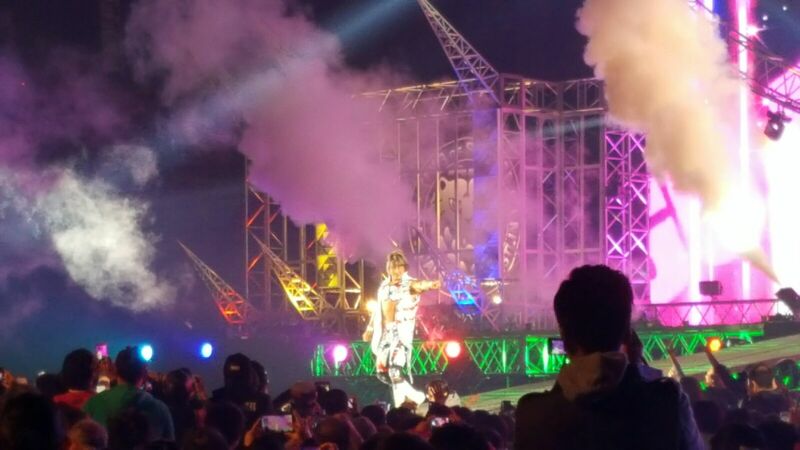 Hiroshi Tanahashi walks the ramp. Big fight feel for this. Naito kept stalling early. They locked up and Naito was backed into the corner. Tanahashi broke clean, then drilled Naito. Naito sent Tanahashi to the floor and teased a dive but instead laid in the ring to mock the former Ace of New Japan. When Tanahashi returned to the ring, they exchanged holds with Tanahashi uncharacteristically cheating to maintain an advantage. Tanahashi was very aggressive early on. He nailed a nice dropkick. Tanahashi worked over Naito with right hands in the corner. He went to the ropes but Naito nailed him from behind. Tanahashi crashed into the ring. Naito measured and stomped away at him. Naito draped his leg over the top rope and attacked it with hard shots. He nailed a big dropkick and a swinging kick in the corner. Tanahashi rolled around on the mat, grabbing at his left knee. Naito focused on the knee and drilled it into the apron, then shoved referee Red Shoes down. Tanahashi fired back with a series of rights but an attempted kick was thwarted when Naito shoved the leg into the referee and drilled him with a dropkick to the knee. Tanahashi locked on a figure four but Tanahashi was able to grab the ropes. Tanahashi began to mount a comeback with forearm smashes. Naito drilled him low to cut off the assault. Tanahashi fired back but went down when his knee was nailed yet again. Naito charged him in the corner but Tanahashi used the ropes to help him keep balance as he kicked Naito away. Tanahashi nailed slams and chops on Naito. He nailed a somersault senton off the ropes for a two count. He continued the battle to the mid-section. Naito cut him off and drilled his knee. Tanahashi still nailed a low dropkick but was unable to lock in a Texas Cloverleaf as Naito went to the ropes. He went to grab Naito was spit in the face by Naito. Naito ended up on the apron outside and caught with a dragon screw legwhip. Tanahashi nailed a Sling Blade outside on the apron. Naito crashed down to the floor. Tanahashi nailed a frog splash bodypress from the top rope to the floor. Tanahashi continued the assault and went to the top but Naito stumbled into the ropes and down Tanahashi crashed, crotching himself. Naito began attacking Tanahashi's knee with shots. Naito went to the top and nailed a rana off the top into the ring, then nailed a German suplex for a two count. Naito's leg was buckling from all the earlier beating. Naito nailed a sideslam for a two count. Tanahashi went and nailed another low dropkick. Naito rolled him into a leg submission. Tanahashi fought his way out and was able to turn Naito over into a Texas Cloverleaf. Naito was finally able to slide himself under the bottom rope to force a break. Tanahashi grabbed at his leg and finally snapped it over. Tanahashi nailed another Sling Blade, the followed up with yet another. He covered Naito but was unable to get the pin. Tanahashi went to the top and nailed the bodypress, then went right back up. Tanahashi went for a frog splash but Naito rolled out of the way. Naito nailed Destino and then followed up, attempting another but was caught and snapped Naito down. They battled back and forth with right hands. Naito worked over Tanahashi but was caught with a Dragon Suplex, only to see Naito escape at the last second. Tanahashi went to the top and nailed the splash to Naito's back, then went back up and executed the move again, only to see Naito pull down his knees up. It looked brutal. The story was that now Naito had probably hurt his other knee. Tanahashi charged but Naito went to kick him. Tanahashi held the leg but was caught with an enzuigiri, Naito nailed Super Destino off the ropes but Tanahashi got his shoulder up at the last second. Naito nailed Destino again and scored the pin. Your winner and still IWGP Intercontinental champion, Tetsuya Naito! Another really good match that told a great physical story. The idea was that Tanahashi had once again failed to win, shocking everone. Naito becomes the only champion thus far to retain his belt tonight. IWGP Heavyweight champion Kazuchika Okada vs. Kenny Omega. They played a video starring Omega where he recreated scenes from the original "The Terminator" film. He then came out wearing a Terminator mask similar to when half of Arnold's face was exposed in the film while sporting a gun. The Young Bucks were at ringside with him. akada did a big entrance with thousands of "Okada Dollars" falling down to the crowd. Some good back and forth wrestling early on. Omega gained control and kicked and beat Okada. Okada tried to send him off into the ropes but Omega held on and brought him down to the mat. Okada nailed a belly to back suplex but Omega held onto the headlock. Okada nailed several shots to the mid-section. Okada finally broke free but Omega was able to bridge out of a pinfall attempt and use a backslide. Okada nailed a series of armdrags before securing an armbar. Omega backed himself into the ropes, forcing a break. Okada broke free and they went back and forth. Okada was spit in the face and went after Omega, who went to the floor, playing mind games. When he returned to the ring, Okada cut him off and dropkicked him out of the ring to the floor. Okada sent Omega into the barricade hard. He went under the ring for a table but Omega attacked him before he could utilize it. Okada sent Omega back over the barricade. He charged and nailed a running high cross bodyblock over the barricade on the floor. Okada tossed Omega back into the ring and slammed him. Okada nailed a slingshot splash for a two count. Okada locked on a chinlock. Omega fought his way up but was snapped down with a neckbreaker for a two count. Omega fired back with a series of right hands but was kicked in the gut. Omega nailed a sliding kick to the shin and then drove him down with a famouser-esque move for a two count. Okada's lower back was attacked and focused upon by Omega. Omega missed an elbow but Okada missed a back senton splash. Omega drilled him with a knee to the back and kidneys. Okada fought back but was cut off. Omega went for a suplex but Okada kneed him and then punted him with a kick to the face. Omega sent Okada to the floor and nailed a big flip dive to the floor. New Japan shot this with the camera low to the ground looking up, so the dive was made to look even more spectacular. Okada was picked up and slammed into the ropes and apron. The idea here is that Omega is trying to wreck the champion's back en route to victory. Omega went to the top and nailed a missile dropkick to the back of Okada's head. IT LOOKED EVIL, even in replay. He covered the champion but Okada grabbed the rope. Omega brought him to the center of the ring and cinched in a chinlock style submission. Omega went for a piledriver but Okada tried to fight his way out of it. Omega scored with several knee strikes. Okada caught him and nailed a DVDR for a two count. Okada nailed a running European uppercut. Okada cinched in a rear chinlock but Omega was able to get to the ropes to break the submission. Omega was caught during a charge. Okada drilled Omega with a kryptonite krunch to the knee and ascended to the top rope. Okada went for an elbow but Omega pulled his knees up and stunned the champion. Omega nailed a backbreaker. Okada went to the floor and leaned against the apron. Omega charged across the ring and dropkicked him in the back of the head, sending him over the barricade and onto the Japanese announcing team. Omega nailed a gorgeous springboard moonsault to the outside of the barricade. Sabu would have nodded in approval. Okada was out and finally made it back over the barricade. Omega slammed the table that Okada pulled out earlier atop of him and nailed an evil looking running double stomp on the table. It looked brutal. Omega pulled Okada into the ring and nailed a powerbomb but Okada kicked out at the last second. Omega nailed another powerbomb but again, Omega was only able to score a two count. The Young Bucks set up the same table on the outside of the ring. Omega pulled Okada to the outside of the apron, intent on doing something terrible to the champion. Omega beat Okada's back over and over. Okada slammed Okada hard into the buckles with an Irish Whip. He charged but was kicked off. Omega nailed a moonsault off the buckles and scored a two count. Okada was able to place Omega on the top rope and dropkick him over the top to the floor, where he crashed down on the apron and to the floor. Okada pulled Omega on his shoulders and they battled over the table on the outside. Omega charged and was backdropped HIGH into the air and came down on the outside in the most spectacular fashion imaginable. It was awesome and brutal. Doctors and The Young Bucks swarmed over Omega. Okada left the ring to break the count and tossed Omega back into the ring. He came off the top with a big missile dropkick for a close two count. Okada nailed a big elbow off the ropes and called for the Rainmaker. Omega was worked over as Okada focused on the lower back. Okada went for the Rainmakers but was driven backwards into the buckles. Omega tried to force Okada up on the ropes but his lower back was too hurt. Okada fired away with forearms. Omega slapped him hard and placed the champion on the top rope. Omega set up for a belly to back superplex but Okada defended himself with elbows and sent Okada to the mat below. 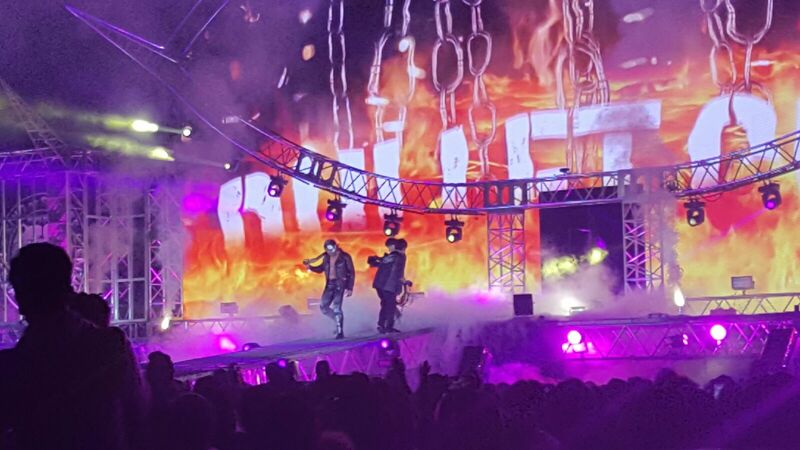 Omega recovered and attempted to set up for his release Dragon Superplex. He nailed it and it was just evil. The replay made it look event worse. Omega covered Okada, who barely kicked up at the last second. Omega drilled Okada with a suplex into a neckbreaker over the knee, setting up for the One Winged Angel. Omega misses a running charge and is nailed with a high German suplex. Omega ducks the Rainmaker and DRILLED him with a big knee. He rebounded off the ropes but was caught out of nowhere with a dropkick. This is just sensational stuff! Omega nailed several knee strike attempts. They were initially blocked but he nailed the third and fired up with a reverse rana. Omega nailing a running knee against the ropes. He went for the One Winged Angel but Okada avoided it and spiked Omega with a tombstone piledriver and The Rainmaker but Omega kicked up at the last second. Okada tried to pull up Omega, who was out. Omega nailed some shots to the mid-sections, trying to fight off Okada. It didn't work. Omega raked his eyes. That worked better. Okada killed him with a dropkick into the buckles. Never mind! Okada went for the tombstone but it was reversed and turned into a cradle tombstone, but somehow Okada again kicked out. This is nuts! They brawled like madmen. Omega nailed a running knee but Okada kicked out at the last second. Undaunted, Omega nailed another running knee. He went for the One Winged Angel but Okada slipped out and nailed the Rainmaker. Omega nailed a series of STIFF knees but Okada caught him with another Rainmaker. Okada and Omega each missed Rainmaker attempts. Omega nailed a dropkick, mocked Okada's mannerisms and pulled him into a big knee strike. Omega went for a One Winged Angel but Okada turned it into a leaping tombstone, nailed a Rainmaker and scored the pin. 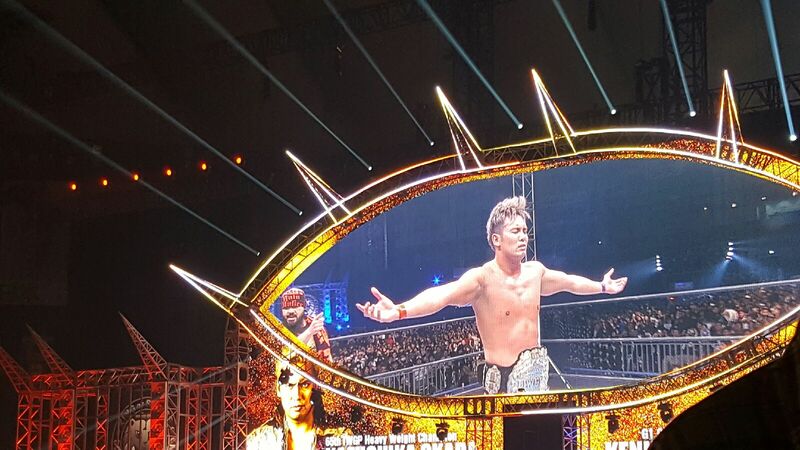 Your winner and still IWGP champion, Kazuchika Okada! That was one of the best matches I've ever seen. It was absolutely breathtaking. There were no losers here, just an army of winners as anyone who witnessed this got an incredible performance. They strapped the title around Okada's waist as The Bucks carried a spent Omega out of the ring. Okada cut a promo to close the show, but sadly, I don't speak Japanese. The top four matches were absolutely great. Thank you for logging in and support PWInsider.com.